On social media, there are a lot of thoughts and prayers going out for those in Texas who have been affected by Hurricane Harvey. It’s important to start organizing recovery efforts now. There are many rescue efforts going on still as well. I figured that a post listing all the ways you can get involved to help, as I come across them, in one space would be helpful. If you know of organizations or efforts being made that I have missed, please post in the comments. I will update and share as I come across new information. Here is a list of shelters that are open in the area. Many of these shelters are accepting people and their pets. Please take your pets if you have them. If you are in a situation where you need to be rescued, do not go into your attic. Go onto your roof. 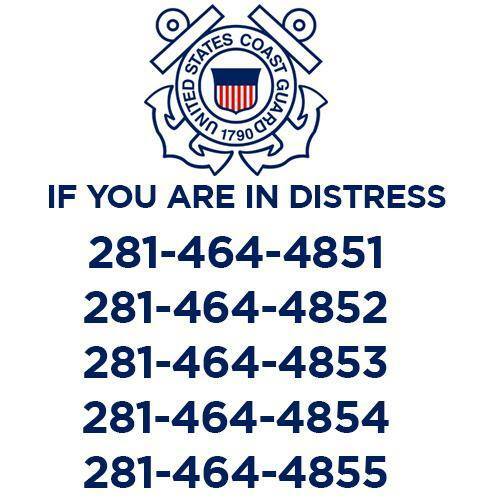 Coast Guard numbers if you or someone you know needs help are to the right. Don’t hesitate to call. FEMA has put together a resource for those affected by Harvey. There is a lot of information in this document about when to call for help, who to call, and how to stay safe. Portlight is aiding those with disabilities. If you need assistance, please call 1-800-626-4959. The Islamic Society of Greater Houston has all 21 of their mosques open and ready to help people. FEMA is helping with rooms. Call 1-800-621-3362 to register. The Red Cross – They’re the usual folks involved with disaster recovery. You can text “Harvey” to 90999 to donate $10 to the cause. The Houston Food Bank is accepting donations. Best Friends has put together a list of resources for helping animals affected by the storm. Catholic Charities USA is taking donations. Global Giving has established a Hurricane Relief fund. The Greater Houston Community Foundation is accepting donations. UMCOR has first responders in the area, they are collecting relief kits and donations. They will be asking for volunteers but they ask that individuals wait for an invitation. The Salvation Army is collecting donations to help. The United Way has put together a fund for victims of Harvey’s path. In addition to monetary donations, The Red Cross will need blood for injured victims. Austin Pets Alive is looking for people who can foster animals through adoption, donations, volunteers, in-kind donations, and people willing to adopt rescued animals. There are many GoFundMe Campaigns set up for aiding with recovery efforts. Be sure to vet any campaigns you wish to be part of. The North American Mission Board is responding to Hurricane Harvey. Carter Blood Care and Donating For Life are also both accepting blood donations from those in the area who are able. Coalition for the Homeless of Houston/Harris County is accepting donations for hurricane relief. AirBNB is waiving service fees for those affected by the disaster. They’re also looking for those who can donate spaces for free for those displaced by the disaster. Feeding Texas is accepting donations to help food pantries. Food Bank of the Golden Crescent, Southeast Texas Food Bank, Food Bank of the Rio Grande Valley, Brazos Valley Food Bank, Central Texas Food Bank, San Antonio Food Bank, Galveston County Food Bank, and Food Bank of Corpus Christi are all taking donations to aid with recovery efforts and emergency food needs in the areas affected by the hurricane. SPCA of Texas is helping with animal rescues and relocations. Diapers are going to be a big need in the area. Here’s how you can help with that – The Texas Diaper Bank. Save the Children is putting together a relief fund and they will need donations to aid children and families displaced by the event. All Hands Volunteers is looking for people who want to start fundraising to support recovery efforts. UPDATE: They now have a volunteer sign up sheet here. Driscoll Children’s Hospital is taking children who need relocation and aid. They are also taking NICU patients from other hospitals and giving them care. You can donate to them here. The Coastal Bend Disaster Recovery Group is looking for volunteers and both monetary and materials donations. Heart to Heart is looking for donations and volunteers. Dallas Animal Services is looking for in kind and monetary donations. The San Antonio Humane Society is in need of item donations. Starbucks is collecting donations at their locations to aid with recovery efforts. iTunes is being used by Apple as a means of collecting donations. Convoy of Hope is collecting money for their recovery efforts. Austin Disaster Relief network is accepting in kind items and monetary donations to aid victims. The Navy Marine Corps Relief Society is accepting donations to assist others. Texas Environmental Justice Advocacy Services (Tejas) is accepting donations and has a lot of updated news on recovery efforts. Volunteer Houston is asking for volunteers and putting people in touch with agencies based on their skill sets. Texas Workers Relief Fund is accepting donations and volunteers to help Texas’ working families to get back on their feet after this disaster. RN Relief Network is accepting donations; to volunteer to help, call 1-800-578-8225. There is a YouCaring campaign raising money for relief efforts. I’m sure there are many more organizations. PLEASE share organizations in the comments and I will add more as I come across them. Share this post widely!